In the last article blog post on this project I spoke about choosing and converting the Wvyern and the General riding it. You can read that posting HERE. Now that the model is complete I set about painting it up and getting it ready for the wargaming table. It was a straight forward and enjoyable couple of hours painting. Painting the converted Wyvern with Rider was relatively straightforward. Gold and silver for rider's armour, with the occasional dash of Alazarin Crimson on the cloth and banners to create a deep reddish pink. The rider is female and that was taken into account. The monster's main colour had to be purple, the colour of enchantment and fitting for a "good" aligned monster. Oriental Violet was used, higlighted to various degrees by adding Titanum White. Where a wash was needed, a mixture of Violet Ink and Acrylic Matt Medium was used. This gave a deep richness to the scales texture on the Wyvern's body. This did not take overly long for, aside from the details, the monster is all scales. I used the excellent Pebeo Studio Acylics range for the painting and the titles of the colours refer to this range. You can see this range stocked by 15mm.co.uk HERE. 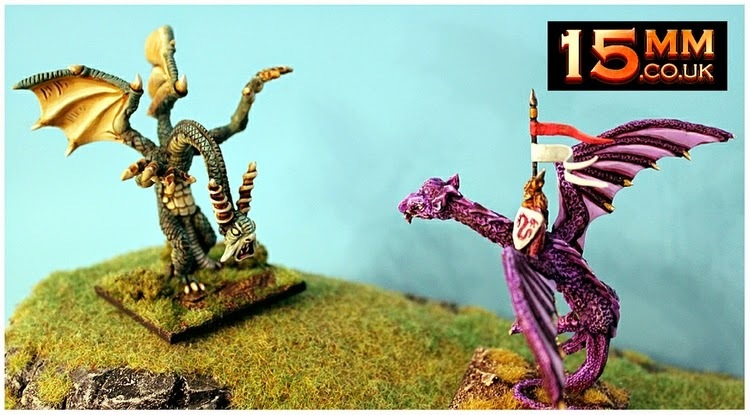 My Wvyern General faces up to the HOT94 Jabberwock! 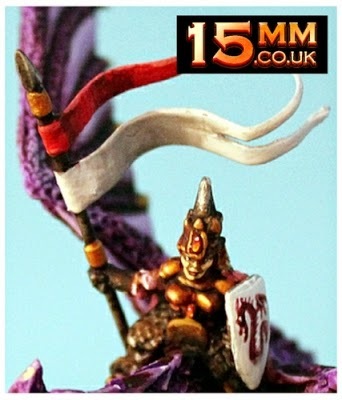 In all it was a very quick but eye catching conversion, a great centerpiece for one's 15mm Elf army. I could not resist a quick photo with my Wyvern facing off against a creature designed by me the HOT94 Jabberwock. Who would win? 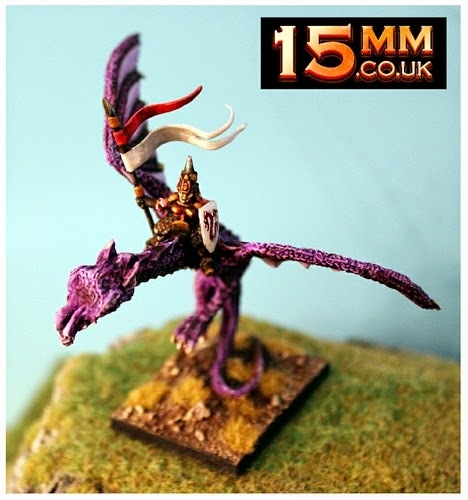 As we promised in part one of this project we have made an update to the HOT34 Wyvern page of the website and included an option there for you to purchase the creature with an Elf rider so that you can undertake this simple build in your own time. Find it HERE. HOF Fire-Team book and battleboards now a paid for digital download! RAP012 Chuhuac Heavy Combat Cyberform released! Sengoku 15mm Japanese Fantasy Range released! HOF28 Charger APC multi-role vehicle released!